New Hampshire Legal Assistance Can Help! BERLIN – Beginning in January 2018, New Hampshire Legal Assistance will be holding a clinic on the second Friday of each month at the Coös County ServiceLink in Berlin to help individuals execute financial powers of attorney. There is no cost for this service. Clinic hours will be from 10 a.m. to 2 p.m. To schedule an appointment contact Coös County ServiceLink. Please expect to spend up to one hour at your appointment. Coös County Aging & Disability Resource Counseling at ServiceLink served more than 4,766 contacts with detailed information about benefits, programs, and resources with over $138,288 in saving to clients in Coös County. That included 675 Medicare and 614 Medicaid contacts, where our highly skilled staff is able to help people navigate their way through the confusing decisions about benefits and eligibility, in order to make the best decisions possible for themselves. 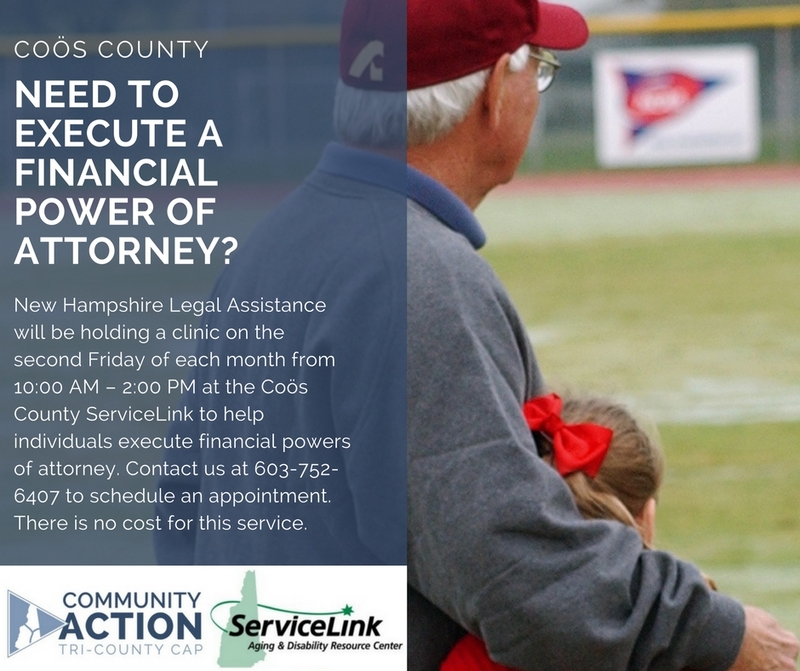 New Hampshire Legal Assistance will be holding a clinic on the second Friday of each month at the Coös County ServiceLink in Berlin to help individuals execute financial powers of attorney. There is no cost for this service. Clinic hours will be from 10 a.m. to 2 p.m. To schedule an appointment contact Coös County ServiceLink at (603) 752-6407. Or visit 610 Sullivan St., Berlin.